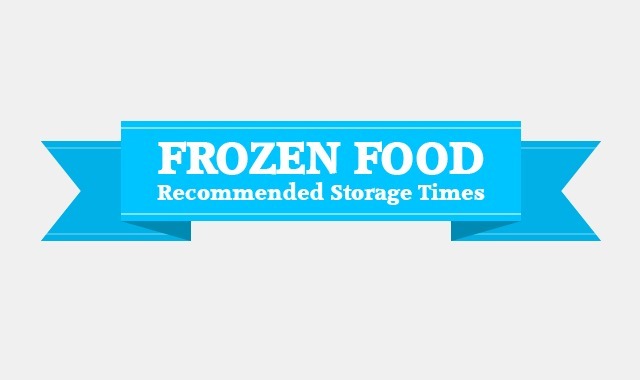 Frozen Food Recommended Storage Times #infographic ~ Visualistan '+g+"
The following infographic on frozen food recommended storage times provides visual and numerical information about how long it is safe to store different types of food in the freezer. It works as a reminder of how long we can keep our meat, seafood, produce, dairy, beverages and some other types of food stored before its quality deteriorates. The infographic also includes information about which types of food do not freeze well, as well as tips on proper food packaging handling before freezing the products. Frozen Food Recommended Storage Times infographic should be kept in a prominent place in the kitchen (on the fridge, freezer, counter, etc. ), where it can be quickly and easily reviewed when necessary. It encourages better kitchen organization and well-organized meal planning, which in turn facilitate healthier eating habits and better food budget planning. Users can embed the infographic on their blog or website to spread information about these helpful frozen food tips. You shouldn't freeze live clams, mussels, or oysters. They should always be cooked alive and fresh as their enzymes break down pretty fast the moment they die making way for food-borne illnesses. They can be frozen once they are cooked but never, ever live. That's pretty bad misinformation from huff post, I'm pretty disappointed.